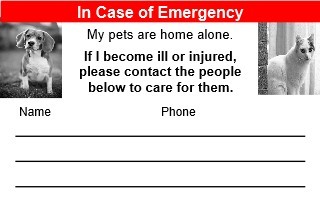 This is a great idea sent to me by one of the TAPF followers…a emergency alert card to carry in your wallet to notify authorities you have pets at home that need to be cared for in case you are injured or become ill. Many pet owners live alone and worry that should an accident or illness occur, who would care for their pets. Below is an example card (business card size) you can print to carry in your wallet (or design your own). Fill in the emergency contact information of family or friends who have access to your home and can care for your pets and carry in your wallet. Thanks to Jan for sending this!!! I use the ICE feature on my cellphone for this info, even including detailed feeding instructions in the notes. When ICE is opened on my phone, one of the first lines reads: “I have animals at home that need to be fed.” That way if a first responder checks my phone they’ll see it immediately. I worked for nearly 30 years in the Emergency Room. Unidentified and unconscious people were frequently our patients. I alway checked on possible pets, but that was because it was a personal priority. It would not get done if there was not someone like me doing it. The one suggestion I would make to the pet notification card would be to incorporate it into the “people” notification card, including who/how to notify, doctors, plus medications, critical medical information. Once the “people” notification information was found, the pet card might be inadvertently overlooked. Excellent advice! Knowing the patient has pets doesn’t help unless there’s someone to contact to let them know. This is such a practical idea my guess is many of us forget about. In cases of emergency everybody searches for a Drivers License or ID Card in the person’s purse or wallet. So I’d tape a one-line reminder on the back of it like: “Contact [name of & phone #] to care for my pets.” After all, your personal in case of emergency person might be a semi-long distance relative or friend. But if you can make a cooperative arrangement with a next door neighbor even better. In our area we have earthquake and other evacuation scenarios. We also have a sticker on the window right next to the front door that says please remember to rescue the number and kind of pets in the home owner’s absence. By the way, for people in California, unless you make specific arrangements with a designated person to come into your home to round up your pets in your absence (should something dire happen to you) they will be considered “property” and under State regulation Animal Control may end with them. That’s even before people get to the reading of a Will or Trust. I will certainly put this up on my website. It is also good to make an ICE packet and leave it in the glove box of your vehicle(s) and one in the freezer portion of your refrigerator. Thank you Heather for the idea of putting info in my cell phone ICE app. If you travel and have pets it is a good idea to leave instructions with your pet sitter/boarding facility as to whom to contact to care for your pets in case of your extended illness or death. Being a pet sitter, I have a form that I have all my clients fill out with that information so I know how to proceed in these situations. I also use Health Directives for the pets if they are ill/elderly as to the client’s wishes for the remains if their pet passes while in my care. I have a policy in my pet sitting business that I require all clients to call/text me when they arrive home and I let them know that in case of an emergency on their part I will continue to care for the pets until notified by the client or family member that other arrangements have now been made for continued care. I saw the pdf file you posted the url for. Very nice. I will be printing it out. I don’t have a card like that but I do have an emergency alert for my health issues and a couple of years ago added care information on that alert about my cat and what i feed her plus what she has been diagnosed with. I also gave the name of my vet and a friend who has sat for her as a contact person. I also have posted on my fridge instructions for Nutmeg (food, water, etc.) should anything happen to me. Our pets are vitally important and have been given to us to cherish and care for. Proverbs 12:10 says, “Whoever is righteous has regard for the life of his animal…” We have to care for our pets like we do humans for they are utterly dependent on us. I am glad to see this card alert. This is excellent, Susan. I am including info for a second contact as well. Thank you. My dog’s breeder made her own one of those years ago, along with taping a big, printed note to the dash in her two cars. They both say that she lives alone and has dogs that require her immediate care. She lists three contacts: myself since I’m closest, her friend a few hours away who also has control of medical decisions for her, and a third friend 10 hours away. Thanks for sharing this; great suggestions! Wow, I just suggested this “all pet,” vs just dog, redo of an existing card yesterday. People were thrilled with the idea. Thanks to Roxanne H. For getting the template rolling! So then you can print off the business card Roxanne showed you, have that clipped to your key ring and viola! Where is the best place to carry this where medical people would look and where can I buy one? This is a wonderful ideas, that help me to realize something important that I need to do for my cat. I have to find someone who will be helping me, it’s hard because my relatives they don’t like pets. I will try to ask around. Thank you Regards. Minhtrinh.